When the universe closes a door, it opens a window. And indeed it was so when our attempt to follow a recipe for a (naturally gluten-free) empanada using mashed plantains for the dough failed miserably. The recipe’s chipotle-spiked black bean filling was nothing short of miraculous. But while the plantain-based dough made a delectable fork-mate to the filling, it was too crumbly to respectably envelop it like a proper empanada pocket. As I wallowed in our tasty but decidedly unphotogenic empanada experiment, my resourceful husband Alex had a brilliant idea: why not change the recipe from empanada to tamale? And just like that, the window had opened. A healthy tamale? ¿Es posible? Fact #1: Tamales are quite delicious. Fact #2: Tamales are typically made with a dough that combines masa harina (cornmeal made from corn that’s been soaked in limewater) and a somewhat obscene amount of fat–usually butter or lard. The lard renders most restaurant tamales off-limits to the vegetarian crowd, and even the butter-based approach makes homemade tamales a tough sell for those of us trying to keep our intake of artery-clogging saturated fat to a minimum. Given these two facts, the prospect of a tamale dough that’s appropriately textured, 100% fat free, vegetarian and nutritious is a pretty big coup. A coup, I’m delighted to say, we pulled off, thanks to some cooked mashed plantains and a little bit of creativity. Plantains (plátanos in Spanish) are a fruit that resemble large, thick-skinned bananas and are commonly featured in Caribbean cuisine. They are used both when unripe (green skin) as well as ripe (yellow to black skin); they are starchier when unripe and sweeter when riper. Although related to the banana, plantains are usually cooked prior to eating; they have a drier, starchier texture and less banana-ey flavor than bananas. Nutritionally, they’re closer to a starchy vegetable (like a potato) than to a fruit. Like potatoes, plantains are a great source of blood-pressure-lowering potassium. And as I recently discovered, when baked, mashed and lightly salted, plantains provide an excellent, fat-free alternative to a traditional tamale dough. Of course, a quick google search after-the-fact revealed that Alex and I were not the first people to come up with the idea of Plantain Tamales (hmmmph! ), but I’m still pretty darn proud of us all the same. This recipe was inspired by and adapted from a recipe for Roasted Plantain Empanadas from NYC’s Dos Caminos restaurant’s “Mod Mex” cookbook, by Scott Lundquist and Joanna Pruess. (The more-addictive-than-crack black bean filling is taken exactly–and reverently– from the cookbook. I’d suggest doubling the recipe, in fact, if you’d like to serve extra on top of the tamales… or perhaps to accommodate nibbling while you wait patiently for the tamales to cook.) And if tamales seem like too much work, try making just the filling for omelets or to serve with rice… it’s SO very good. Soak the corn husks in warm water in a large shallow baking dish (per above instructions) prior to getting started. 4. Make the tamale filling: Heat a medium, non-stick skillet over medium heat. Add oil, then onion, and saute until onion is lightly browned–about 5-6 minutes. Stir in garlic, cook 1 minute, then add black beans, half of the water (1/4 cup) and the chopped chipotle chili. As the filling cooks, mash the mixture with a potato masher (or back of a wooden spoon) until chunky-smooth. Add remaining 1/4 cup water, season to taste with salt. Add the chopped scallions, the grated cheese and remove from heat. 5. Assemble the tamales: Lay a pre-soaked corn husk flat on working surface. Spoon ~1/4 cup tamale dough (mashed plantain mixture) onto center of the husk and, using your fingers, spread it on the husk leaving a 1″ border all around. Spoon 1/6 of the bean mixture across the dough. Fold the tamale shut as follows: start by pulling up the longer edges of the husk until the edges of the plantain mash meet and fold over onto themselves, forming a tube around the bean filling. Then, tuck one edge of the husk between the outside of the dough tube and the other husk. Now you will have a tube-like tamale open on two sides. Then, fold one of the remaining open sides so that the tamale has only one open end. 6. Steam the tamales: Drop a penny into a large saucepan and fill with water up until the level of a steamer basket. Bring water to a boil; you will hear the penny rattling around so long as there is sufficient water in the pot. (Over the course of the cooking time, listen for the penny rattling and add more water to the pot if the rattling sound stops.) When water is boiling, pile the folded tamales into steamer basket, seam side down, cover saucepan with a tight-fitting lid, and steam for 45 minutes, replenishing water as needed. 7. To serve: Remove tamales from steamer basket. Place on a plate, unfold the husk, and garnish with salsa of your choice (a chipotle salsa or salsa verde would work great), some additional shredded cheese and/or chopped cilantro to your liking. I’ve wanted to try making Korean Japchae noodles for ages, but abandoned the project prematurely when I discovered one of the local Korean markets in my neighborhood didn’t sell the star ingredient– sweet potato starch-based vermicelli. Since this signature dish at Korean restaurants contains soy sauce (not gluten-free for a celiac gal like me), I knew that if I was ever going to taste Japchae noodles, I’d better make them myself. But after securing the elusive noodles at a local Asian supermarket, I was in business. And a small small bundle of additional ingredients later– 1/4 lb of fresh shiitakes, a carrot, some scallions and a bag of baby spinach leaves– I was headed home to try my hand at Korean cooking. I followed this recipe from Chow.com almost to a tee, swapping out the regular soy sauce for reduced sodium, wheat-free Tamari sauce instead. It was a FUN recipe to make! 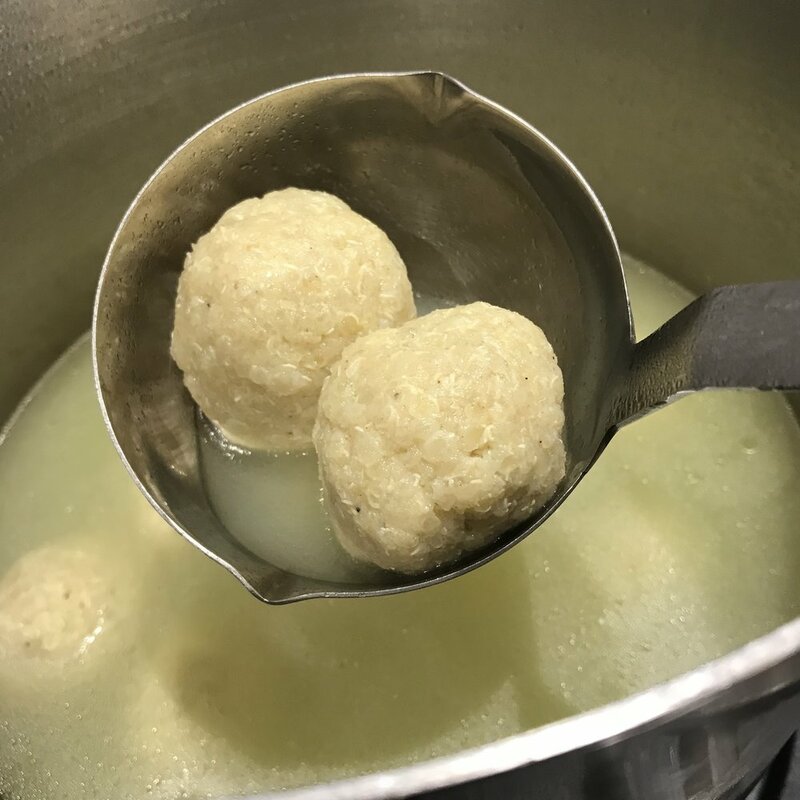 The highlights for me were using kitchen shears to trim fat, sesame-oil slicked noodles into manageable segments (a project I’d recommend you allow an older child to help with… it’s such a tactile pleasure to slice through those plump, slippery things!) and practicing my knife skills to achieve matchstick carrots and paper-thin shiitake slices that would find camouflage enough in the noodles so that my kids won’t pick them out. To keep this dish interactive, try letting toddlers and preschoolers sprinkle their own sesame seeds on top when serving. If you know not the creamy comfort that is biting into an enormous and aptly-named gigante bean, then it is my mission today to convince you to seek out this elusive packet of leguminous deliciousness. While many folks profess to like beans, they fail to see what inspires my unbridled passion for these little packets of complex-carbohydrate goodness. After all, the American bean vocabulary tends to be pretty limited: we know garbanzos, kidneys, black beans and cannelinis. Occasionally we dabble in pintos or black-eyed peas. But unless it comes in a can, most of us can’t be bothered to expand our bean horizons. If ever there was a bean to inspire a nation to abandon its lazybean tendencies, however, surely the Gigante (aka: Gigande, Yigante, Hija) must be it. Most popular in Greek cuisine (yes, the same clever people who brought us geometry and democracy have also retained this most delicious of beans in their collective leguminous repertoire), gigante beans boast a divine creamy texture and the ability to maintain their shape after all sorts of cooking. I decided it was time to start making my own gigantes after the $9.99/lb Antipasto bar at Whole Foods lured me in one time too many with that ridiculously delicious Gigante Bean salad of theirs. (What kind of person spends $18.98 on an impulse bean purchase?!) Like all bean varieties, Gigantes are an excellent source of complex carbohydrate, protein, fiber, antioxidants and a good source of iron. My new favorite place to buy beans is Purcell Mountain Farms, an Idaho-based farm with an excellent online store. In addition to having the most reasonable prices for my favorite hard-to-find Gigante beans and Beluga lentils, they offer a surprising variety of organic and heirloom bean varieties with romantic names and fashionable appearances. If you are a bean buff and are interested in learning more about the folklore behind the wide, wonderful world of beans–as well as how to prepare them–I strongly recommend Aliza Green’s essential cookbook, Beans, from which I learned, for example, that Gigante beans are a variety of so-called “runner beans” that were brought to America from Greece and Spain. While I resisted it for years, I have come to discover that cooking beans from dry isn’t nearly as annoying as I had thought it would be. If you have the foresight to plan ahead, tomorrow night’s dinner beans into a big bowl of water in a ratio of about 3 cups water per 1 cup beans before you go to bed is the easiest way to prep your beans for a faster cooking time the next day. And if you’re as Type A as I am, the feeling of accomplishment that comes with multi-tasking overnight will lull you into a happy, albeit geeky, slumber. This would be the regular soaking method. The quick-soaking method takes about an hour to an hour and a half. In this case, you’d put your beans in a large saucepan so that they’re covered with 2 inches of water. Bring the water to a boil and simmer for 2 minutes. Then, turn off the heat, cover the pan, and let your beans soak in the water for 60-90 minutes, until tender. Drain the water and proceed with your recipe. The #1 rule when cooking any dry bean is to avoid adding acid of any kind with the bean until it is already tender. Don’t add any vinegar, wine, citrus juice, tomato product or anything else acidic to the cooking water until your beans are nice and soft; otherwise, the acid will prevent your beans from softening no matter how long you cook them. Yigandes Plaki: Loosely translates to "Why, oh why, was I not born to a Greek grandmother?" 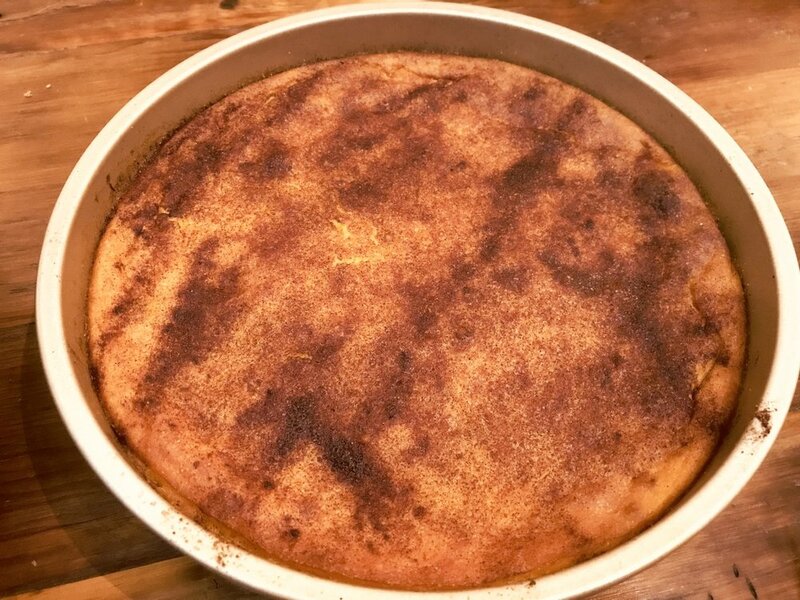 I am obsessed with this first recipe for Greek-style Baked Gigante Beans, (aka Yigandes Plaki) which was adapted from Nancy Harmon Jenkins’ The New Mediterranean Diet Cookbook and posted on another food blog. (Better they should have to deal with the copyright issues than me!) While I’ll admit that it took forever and a half to make, I happen to live in a freezing old house and am all for any recipe that involves keeping the oven on for long periods of time. (If you pre-soak your beans overnight, the first 40-50 minute bean simmering step can be cut in half.) It strikes me that this recipe would be perfectly suited for a slow-cooker, but since I have yet to figure out how to use the slow-cooker I got for my wedding, I will defer to any ambitious crock-pot enthusiasts out there to adapt this recipe on our behalf.) Since I didn’t have fresh herbs, I used a bunch of dry ones (including basil and oregano), which resulted in a final product that, in addition to being mouth-meltingly creamy, gave a similar flavor effect to lasagna…in the best possible way. In fact, I would recommend serving it like you would lasagna; accompanied by a nice garlicky side dish of broccoli rabe or sauteed bitter greens to counteract the sweetness and bring some green to the plate. It is absolutely delicious. If your children don’t like this recipe, then send them back for a refund. Another easy way to serve gigantes is as a room temperature bean salad appetizer. Gigantes are commonly featured among the mezze in Greece, and a salad is a perfect way to pay homage to this civilized bean. Mark Bittman offers an easy-to-follow formula for a Greek-style gigante bean salad in his modern kitchen staple, How to Cook Everything Vegetarian. Roast 1 small red pepper and 1 small green pepper over open flame (your gas burner will do just fine). Peel their skins off and slice peppers into super-thin strips. Mix cooked beans with 1/4 cup apple cider vinegar, 2 TBSP olive oil, 1 TBSP fresh chopped parsley, 1/2 cup (or more, to taste) or roasted pepper strips, 1-2 minced garlic cloves and salt to taste. Let salad marinate in fridge for several hours so flavors can blend. We all have our ingredient buzzwords. You know, those words your eyes gravitate towards on a menu and compel you to order the item that features them? For most people, it’s probably bacon. But in my case, peanut butter and banana are major turn-ons, and fortunately, I have bequeathed this passion to my kiddos, who will happily eat these foods in any incarnation. Always on the search for a healthy, low-sugar, portable snack for the kinder, I came upon a great recipe on my local online mommy board for Oatmeal-Banana-Peanut Butter squares. They were fast, easy, froze well, and when I brought them to the playground for my kids’ snack, I was like the Pied Piper of toddlers… they swarmed me like little toddler zombies in search of brains. The bars’ texture was soft, chewy and cake-like… but not so cakelike as to be crumbly. Perfect, portable toddler fare. I wish I knew this recipe’s origin so I could give proper attribution to its author! Never one to leave good enough alone, however, I thought I could cram even more nutrition into these already wholesome snacks. Since my dear son seems to have strong vegetarian (actually, fruitarian is more accurate) inclinations, I’m always trying to make sure he gets offered one or two iron-rich foods per day. And while oats are naturally a good source of iron… so are chia seeds. So I decided to spike the squares with some chia and see if the kids would notice the difference. I’m happy to report that they did not. I’m even happier to report that these can easily be made gluten-free by using certified GF quick-cooking oats (such as Bob’s Red Mill), that they make a great low-glycemic mid-morning or pre-workout snack, and are nutritious and delicious for kids and kids at heart alike. The recipe as written contains < 1 tsp added sugar per bar, though if your banana is super ripe, you could probably even cut down on the brown sugar even further. Mix together the quick cooking oats, light brown sugar, chia seeds, baking powder, kosher salt and ground cinnamon. Add in the vanilla extract, milk and egg. Mix the ingredients together. Then add in the mashed banana and peanut butter. Combine all of the ingredients. Pour the mixture into a lightly greased 8 by 8 inch metal baking pan. Bake at 350 F degrees for 20 minutes. Cut into squares and enjoy! I hope this uncharacteristic recipe post for a turkey burger doesn’t turn off too many of my most dedicated vegetarian readers. I personally follow a Mediterranean diet, which means lots of beans, whole grains and veggies, but also some poultry and fish. I do feed my kids meat more regularly than I eat it myself, mostly because I've got an aspiring fruitarian son who teeters on the verge of anemia all the time, and I’m constantly obsessing about whether he's getting enough iron. Cook quinoa according to package directions in a very small saucepan. You may need to add a bit of extra water to account for evaporation since the quantity is so small. Note that 1/4 cup dry yields about 1 cup cooked. Meanwhile, while quinoa is cooking, saute the shallots and garlic in olive oil for 1-2 minutes until starting to sweat. Add the zucchini (or spinach) and continue to saute for 2 minutes more until veggies are soft and sweating. Remove from heat. Combine ground turkey, cooked quinoa, worcestershire sauce and sauteed veggies in a mixing bowl. Add a generous pinch of kosher salt. Mix with hands until well-blended. Form mixture into 4 patties of equal size. I never much cared for stuffed grape leaves (or dolmas, as they’re known in Greek) until I tasted my mother-in-law’s version. While I always found other grape leaves to be too briny or bitter or mushy or flavorless, Bella’s are taut little rolls of flavorful, textured rice filling wrapped in a leaf that’s been soaked to remove the tangy briny residue, and marinated in a heavenly lemon-juice-olive oil-garlic sauce until they soak up its Mediterranean deliciousness. From the moment I first tasted one, I knew I had to have the recipe. As soon as I asked for it, everyone just smiled at me pityingly. Bella is a wonderful, self-taught, instinctive cook who has never used a recipe in her life. Even when she owned her own cafe, and made authentic grape leaves, hummus and tabbouleh all from scratch, she still never used recipes. I asked her how she managed to replicate her recipe each time, she replied that she just knows how its supposed to look. Still undaunted, I decided to invite her over and have her give me a grapeleaf tutorial. My plan was to write down the ingredients and quantities in a veritable public service effort to liberate the glorious recipe from her head and share it with the grape-leaf deprived masses. I will preface the rest of this posting by admitting that I was only quasi-successful in my mission: I kinda-sorta pinned her down to a recipe whose quantities will fill a 9×13 baking dish stacked with 2 layers of tightly-packed stuffed leaves, about 80 total. Please forgive the loosey-goosey nature of the pseudo-recipe below. Believe me when I say it is a veritable coup that I even managed to wrangle this out of her. To compensate for the shortcomings, I provided some photos so that you can see what things are supposed to look like at different stages, which is Bella’s preferred gauge. And of course, taste as you go and feel free to improvise. Dried parsley, maybe about 2 TBSP? Can be substituted for fresh parsley or freshly chopped chives, too. Salt and pepper to taste. Spicy Hungarian paprika to taste, optional. Soak the jarred grape leaves in a big mixing bowl full of cold water to remove the brine. Dump water and repeat 2-3 times until the leaves don’t taste salty or feel slimy from the brine. Cook the rice and quinoa separately per package instructions. (~4.5 cups water for the rice and 2 cups water for the quinoa). Meanwhile, while rice is cooking and leaves are soaking, toast the pine nuts or sunflower seeds in a dry saute pan or toaster oven, just until golden/fragrant. Meanwhile, make the marinade. Combine lemon juice, olive oil, crushed garlic and chopped mint into a small bowl, and season with salt and pepper. The marinade will be very strong– garlicky and tangy. That’s what you want. Using your now-drained but still wet grape leaves, lay one grape leaf flat on your working surface. If it has tears or holes in it, place a smaller leaf on top of it to patch it up. Spoon a small amount of rice filling onto the base of the leaf and use your fingers to pinch the rice into a more compact row. See Step 8 below. 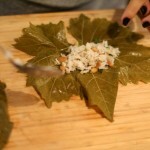 Begin wrapping the grape leaf from the base, pulling the leaf base tightly over your rice mound. Fold in the sides like a burrito and finish rolling. The final product should be tight and compact. Place the stuffed grape leaf into your baking dish, and pack them in tightly together, with the end flap down, as you continue to roll more. When the bottom of the dish is full but before you start stacking the second layer, drizzle half of the marinade on top of the stuffed leaves. See Step 9 below. Continue rolling and stack a second layer on top until the baking dish is full. Drizzle the second half of the marinade onto the top of the second layer of grape leaves. See Step 10 below. Now, fill the baking dish with some water until it’s ~3/4 up the sides of the dish. (I know it sounds weird, but it will help cook the grape leaves through and will boil off in the oven.) Cover with aluminum foil and cook for 30 minutes, then remove the foil and cook for another 30 minutes, until the water boils away. The top layer of grape leaves will be a little dried and brown, but shouldn’t be burnt. The bottom layer will be softer, but more saturated with flavor. Bella’s grape leaves taste best on the second day once they’ve been soaking in their delicious marinade overnight and after being reheated in the oven until warmed through. (Or, microwaved in a pinch). Even better, pour some more lemon juice and olive oil on the grape leaves before re-heating. I’ve always found vegetarian sandwiches to be a bit uninspired. It can be hard to come up with enough substance to make the sandwich satiating– a pile of vegetables just doesn’t do it for me. To be sure, the vegetarian sandwich pantheon has some pretty great occupants: a good egg and cheese; a well-seasoned roasted vegetable with goat cheese; an avocado and cilantro with lime juice and sea salt; pesto grilled cheese; hummus and cukes. But this rotation gets old after awhile, and variety is indeed the spice of life. Of course, I’d eat peanut butter sandwiches happily until the day I die. But nowadays you can’t always pack a PB&J to bring into public spaces, particularly if you’re making a picnic for your kids that will be eaten in public shared spaces, as nut-free zones abound. So you can imagine how revolutionary it was to discover an entirely new sandwich condiment– a nutrient-packed, vegan and densely-flavored one at that– which would serve as the basis for a whole new category of vegetarian sandwiches I could add to my repertoire. This condiment–which hails from Germany and is called simply “streichcreme” (rote Bete-meerrettich)– has been dubbed “pink stuff” by my kids. This sandwich spread is ubiquitous in Germany, and my sister in law always brings us a jar when she visits from Hamburg, where she now lives. It’s a silky-smooth, magenta colored spread whose primary ingredients are roasted beets, sunflower seeds and horseradish. It tastes more of mild horseradish than beets or sunflower seeds, in my humble opinion, and is positively addictive. My kids like to dip mini Triscuits in it as if it’s hummus. I’ve found it most appealing as the basis for a savory breakfast sandwich, paired with cheddar cheese and a handful of peppery arugula leaves (pictured above). I've turned many of my patients on to this breakfast sandwich, and they're as obsessed as I am. Since German ingredient labels list ingredients by percentage, I decided to try to reverse-engineer this product. After a few attempts, I came up with this recipe as the closest approximation to the real deal. My homemade version is more rose colored than magenta, owing to the fact that I don’t have the benefit of “roasted beet concentrate” in my pantry, but the flavor is similar enough. Of course, if you happen to know someone traveling over there for any reason, ask them to pick up a jar for you as a souvenir so you can compare this homemade version to the original. Combine all ingredients in a food processor and process until well blended and very creamy textured. You may need to stop a few times to scrape the sides of the bowl with a spatula to ensure all ingredients are well combined. If ever there was an homage to everything summer– grilled dinners, fresh mint and zucchini from the garden, simple, unfussy recipes– this lovely appetizer would be it. This savory Napoleon recipe was inspired by summertime Caprese salads using fresh basil from the garden and sweet Heirloom tomatoes from the Farmer’s Market. It’s a grilled version that combines some of my favorite ingredients– garden mint, salty Halloumi cheese, and globe-shaped summer squash. What’s that? You’re not familiar with halloumi? Well, allow me to introduce you. It’s a salty sheep and goat’s milk cheese with a firm, slightly rubbery texture, originally from Cypress. I find it more pleasant than feta–with all due respect to the Greeks– as it’s less sharp and tangy. Halloumi’s claim to fame–and what makes it a perfect summer cheese– is that it holds its texture when grilled. In other words, it will soften and get grill marks like a slab of tofu, but won’t melt all over your grill. Like other salty white cheese, halloumi is divine when paired with watermelon and mint in a salad as well. Now, back to our Napoleon. You can make this warm layered appetizer as I’ve written it, or you can improvise by adding additional layers of grilled tomato or eggplant. Use round, globe-shaped ones for visual appeal if they’re available. This will take your Napoleon into ratatouille territory, without all the fuss of sauteing. If you can’t find globe zucchini, then use the biggest, fattest zucchini you can find and cut it lengthwise into four thick slabs, then halve each large slab. Use two pieces each per later. To turn this appy into a meal, serve it atop a bed of well-seasoned quinoa and lightly steamed spinach. Grill zucchini on both sizes until its tender and brown grill marks have formed; just a few short minutes. Remove slices as they’re ready and set aside. When both components are ready, assemble the napolean as follows: Zucchini later, halloumi layer, sprinkle of mint. Repeat layers until all ingredients are used up. Drizzle with balsamic vinegar to taste. Cut into 4 sections and serve! If “taco night” takes your mind to a greasy place of fried tortilla shells stuffed with a generic combo of sloppy refried beans, ground beef, lettuce, shredded cheddar cheese and sour cream, then you’ve been missing out on the taco renaissance currently underway in major cities nationwide. Soft tacos with fresh, flavorful and inventive fillings are the name of the game, and there’s no ground beef, refried beans or cheddar in sight. While my heart belongs to the taco menu at Cascabel Taqueria (and their fabulous Luchador salad on the side), sometimes a girl needs a good, filling vegetarian taco option as well. And this, as it turns out, is easier said than found. I stumbled across the perfect vegetarian taco to satisfy my spicy craving in a nauseous haze during my first trimester of pregnancy, when the very thought of meat made my stomach churn: the Aguacate taco at La Esquina. The taco was a delightfully overstuffed affair starring a gorgeous green hunk of avocado accompanied by a scrambled egg, nestled in a doubled-up soft corn tortilla and accessorized with black beans, citrusy salsa verde, pico de gallo and a crumble of white queso fresco. (That’s a lot of taco to fit into a 6″ wrap… and a deal for just $3!) When drizzled with my favorite hot sauce, El Yucateco, I was in taco heaven. I recently decided it was high time to make my own version of this divine taco creation, staying true to the original concept but swapping out the pico de gallo for some gorgeous pink pickled onions… they’re so easy to make and they have a transformative effect on a workaday taco. If you happen to have a grill going, I’d suggest grilling the avocado to take this recipe from divine to sublime, though the original version used raw avocado and was still perfectly delicious. Instructions on how to grill an avocado follow below. Warm corn tortillas one by one in a frying pan over medium (no oil) until soft; stash warmed tortillas stacked on a plate covered by a kitchen towel to keep warm and soft until ready to serve. Double up corn tortillas and fill each duo with beans, egg and avocado (in that order). Drizzle salsa verde to taste. Top with pickled onions to taste. Sprinkle cotija cheese to taste. Squeeze a lime wedge over the fillings. Serve with your favorite hot sauce as desired. To grill avocados: Slice avocado in half lengthwise and remove pit. Brush with olive oil and lime juice. Grill flesh side down on a hot grill until pretty grill marks appear, about 5-7 minutes. Combine jalapenos, vinegar, sugar and salt in a small saucepan and heat until sugar dissolves. Cover bowl and let steep for 30 minutes. After 30 minutes, pour off the liquid and discard. Store extra pickled onions in a sealed container in fridge for up to a week. I don’t remember all that much about the foods my mother made for us growing up, other than that things were pretty simple and homey. Baked chicken with potatoes and broccoli. Scrambled eggs with salami. Macaroni and cheese with tuna. Chopped liver on Ritz crackers (!). Homemade desserts were equally simple: Chocolate pudding. Frozen bananas. Apple pie. And then there were the pumpkin popsicles. I’m not sure how these frozen pumpkin treats made it into the rotation, though if I had to guess, I’d bet my dad bought a huge pumpkin one year that, when gutted, left a glut of innards that needed to be purposed. In any event, when colder weather came calling, these unusual, creamy pumpkin treats would show up in the freezer. And this was years before popsicles became fashionable and before exotic ice cream flavors made frozen pumpkin treats de rigueur in the frozen confection section of specialty markets. Now, I’m not trying to claim my mom invented Post-It Notes or the Internet, but I’m going to go out on a limb here and assert that she may have been an early pioneer of frozen pumpkin novelties. I asked her recently if she could recall what went into her original recipe. She claims they were made with leftover cooked pumpkin custard that was destined for pie; a blend of pumpkin puree, eggs, milk and sugar. Interesting. But far too much work (and sugar) for my purposes. My goal was a low sugar treat whose creamy texture and warm flavors delivered seasonal indulgence without the requisite fat and calories. One that didn’t require any cooking of ingredients; more like a frozen pumpkin smoothie than a frozen pumpkin pie. To that end, I chose low-fat kefir for creaminess without the fat; some pumpkin pie spice and vanilla extract for flavor, and a touch of agave nectar to take the bland edge off of plain pumpkin puree and tame the tang of the yogurt to allow the warm, autumn flavors to come through. The great thing about using agave is that it’s so much sweeter than sugar, so just a little bit can go much further flavorwise. Also, it’s liquid, which makes it very easy to blend into this recipe. I’ll admit that when the final product was done, even I was surprised at how low calorie and healthy these puppies were. And satisfying! Lastly, I call them “paletas,” which is Spanish for “popsicles,” because I used to work in marketing and recognize that Pumpkin Paletas sounds way more interesting than Pumpkin Popsicles. If you need to market these to xenophobic or neophobic relatives, other descriptive names that would be appropriate would include: Pumpkin Pie On a Stick or Frozen Pumpkin Spice Treats. * To make these lactose-free (as I do), use Green Valley Organics lactose-free kefir**. To make vegan/dairy-free, substitute 1 cup LITE canned coconut milk. It’s a first-world problem that we all face every fall: What to do with that extra bit of pumpkin puree thats leftover from piemaking? In our house, I freeze any remaining puree in an ice cube tray. When the cubes are frozen, transfer them to a freezer-safe ziploc bag. Then, next time you’re making pancakes or waffles from a mix, defrost 2 cubes (about 2oz) of pumpkin puree and add it to the batter along with a dash of cinnamon or pumpkin pie spice. Voila! Pumpkin pancakes! Late summer to early fall is high season for eggplant, and if you’ve hit a farmer’s market during that time, no doubt you’ve noticed the abundant and regal assortment of jewel-toned eggplants on offer. I like a ratatouille as much as the next girl, but somehow my mind always goes blank when faced with gorgeous piles of deep purple eggplants, and I wind up passing it over in favor of more familiar summer produce. 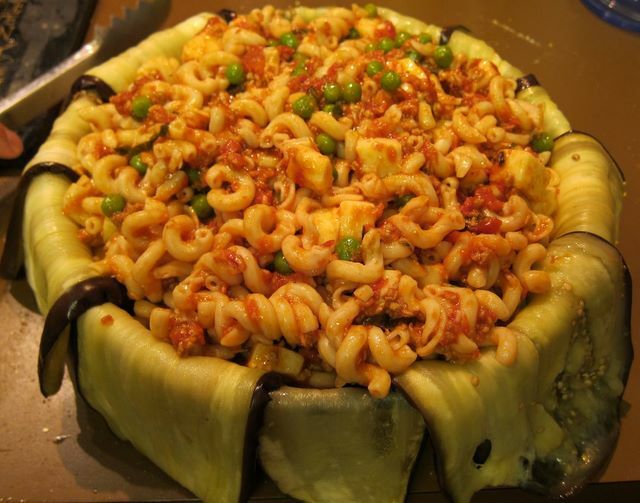 But since my husband took a week-long Italian cooking class and brought home this show-stopping recipe for Timbale– a highly-impressive pasta “cake” wrapped in sliced baked eggplant–we’ve been seeking out the biggest, most beautiful eggplants summer has to offer with a very specific plan in mind. …your Timable will be excellent. Admittedly, Timbale is not an everyday dish given the labor and time that goes into it. But if you’ve got extra hands in the kitchen over Labor Day weekend, its a fun group project, and the results are pretty impressive. Note: the recipe below is offered as a baseline only. As discussed above, feel free to swap vegetable and/or meat ingredients in and out to your liking, so long as you keep the pasta, sauce and cheese in there. Prep is not difficult, but it is multi-step, so be sure to allow adequate time both to prepare the ingredients, to bake the Timbale, and to allow it ample opportunity to cool after baking. It is worth the wait, and your family, Facebook friends and Instagram followers will be very impressed with the outcome. 1 lb penne or similarly-shaped pasta (e.g., fusilli, rotini or spirals), cooked and well-drained. You can absolutely use whole wheat pasta. For gluten free, use gluten-free brown rice pasta. First, slice 3 thin (1/4″ thick) rounds each off the fat end of two of the eggplants for a total of about 6 rounds. Then slice remaining eggplants lengthwise into 1/4″ slices. Sprinkle with salt, place in colander, and let moisture drain for 30 minutes. Rinse eggplant slices and pat dry. Lightly oil a sheet pan (or a few, as needed) with some olive oil, and place eggplant slices on it. Brush the eggplant slices(side facing up only) with olive oil as well and bake until lightly brown (pictured below), about 10-15 minutes. Cool. Next, you’ll make your sauce. If using ground meat and/or alternative vegetables (mushrooms, spinach or zucchini), heat 2 TBSP olive oil in a medium saucepan over medium heat. Add garlic and basil and saute until fragrant, about 1 minute. Add the meat and/or the vegetables, increase heat, and cook until the meat has lost its pink color (about 10 minutes) and/or the veggies are soft and well-cooked and excess water has been cooked off. Add the crushed tomatoes, season with salt and pepper to taste. Reduce heat to medium and cook to allow flavors to blend, about 15 minutes. Add the marsala wine and the peas, cook one minute more just to blend, and remove sauce from heat. In a large bowl, combine your drained pasta with the sauce, the diced mozzarella and 1 cup of the grated romano cheese. Set aside. Now, to prepare the pan. Oil a 10″ springform pan with olive oil and dust with cornmeal as pictured below. 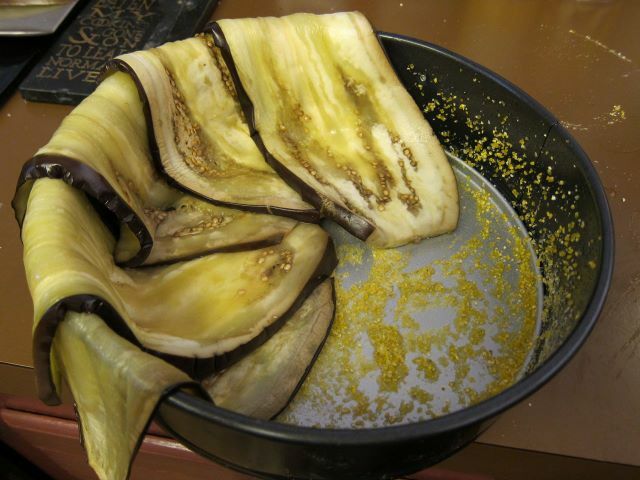 Then, line your cornmeal-dusted springform pan with overlapping slices of the baked eggplant as shown in the pictures, allowing the eggplant to drape over the sides of the pan. (You will use these draping flaps later to seal up the Timbale). 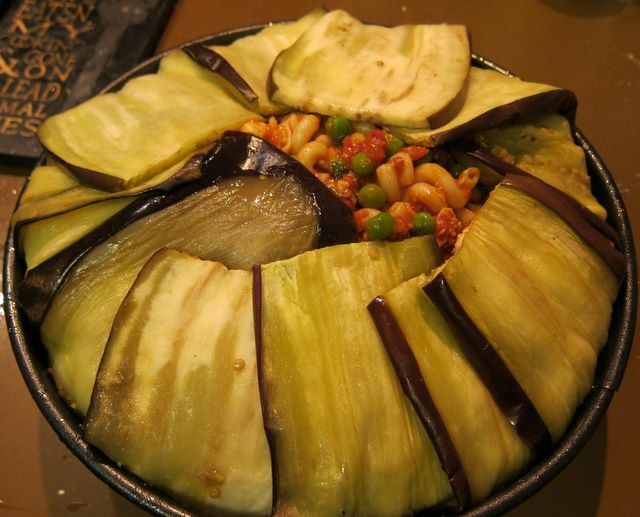 Cover any gaps in the center of the pan with all or part of eggplant slices to ensure the pan is fully lined. Now, spoon the pasta mixture into the springform pan. The mixture should fill it all the way to just beyond the top and form a bit of a mound. Next, fold the draping eggplant flaps over to cover the mound of pasta. Now, top the Timbale with a few slices of the baked eggplant rounds to seal it completely. Using your hands, gently compress the Timbale to make sure its nice and packed in there firmly. Then, sprinkle the top with some remaining grated Romano cheese and put the whole thing in the oven for 35-40 minutes, until the cheeses are melted. Remove from oven and let sit to cool IN THE SPRINGFORM PAN for 45 minutes to an hour. Once Timbale has cooled, place pan on a serving plate/platter and unmold from the Springform pan. Voila! Are your guests impressed yet? If you wish to re-heat before serving (optional; the dish tastes great at room temperature), gently replace the springform mold over the top of the dish and warm in oven at 350 degrees F for 15 minutes. To serve, slice the Timbale like a cake and serve in wedges with extra marinara sauce on the side.